While I write this on the flight back from Seattle to Boston after a long weekend at PAX West, I can only look out the window and think about the amazing time we all had at the show this year! As we tend to do, Harmonix was out in full force with tons of things happening all weekend long. 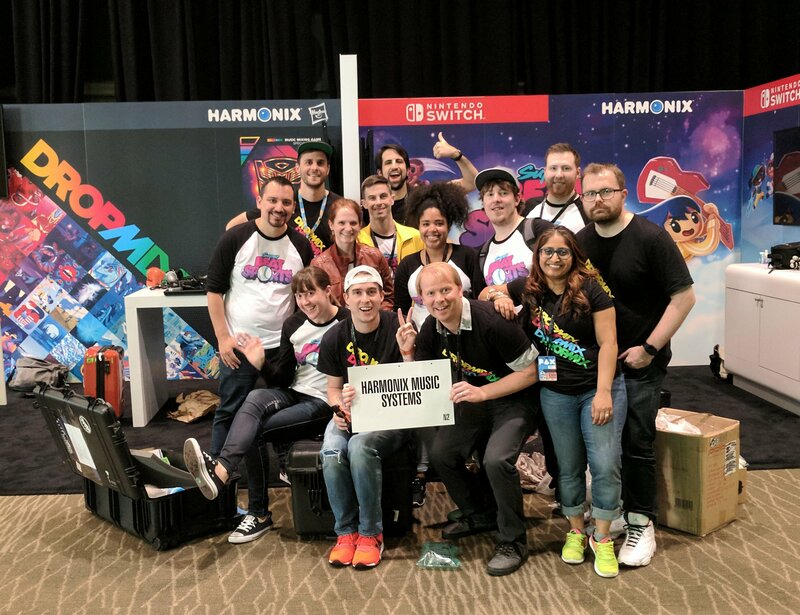 Our new location in the fourth floor lobby was packed all four days with people playing mind-blowing music mixes and whacky rhythmic sports, we made appearances on both the Twitch and Mixer stages, and we even brought a few new faces to Seattle for their first Harmonix PAX experience. 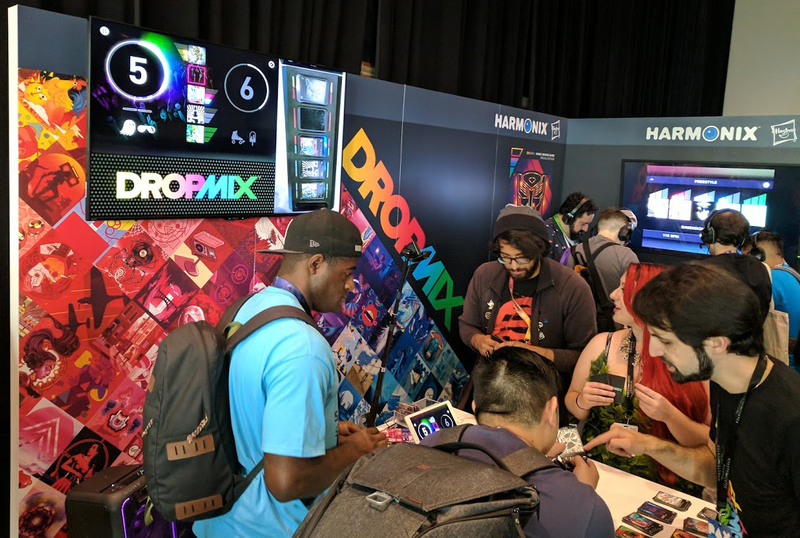 We brought our brand-new music mixing card game DropMix to PAX West. Not only did Harmonix come to show off the magic of DropMix, but our partners Alex and Sarah from Hasbro also made the trip! We’ve been working on this game a long time and the reception to DropMix was overwhelming. The moment someone played a card for the first time they would immediately smile as they searched for the next hit song to bring into the mix. But things also got heated as players faced off in DropMix’s competitive mode, Clash. There were close, great games all weekend long and it was a ton of fun to watch. As always, PAXers came to win! After a Tweet from Penny Arcade’s very own Tycho Brahe, the PAX enforcers had to double the size of the DropMix line. 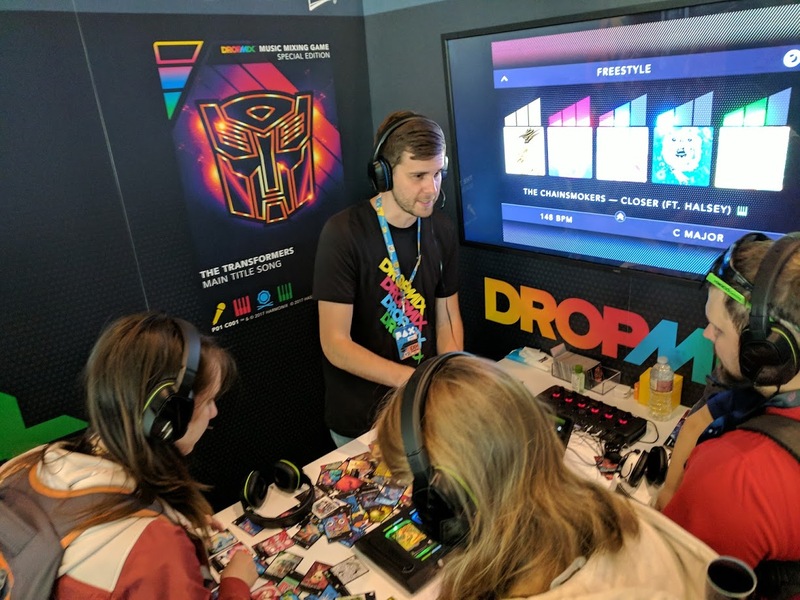 On top of that, people would keep coming back with more of their friends as “they just had to see and experience it!” We even had a brand new DropMix super fan practically live at our booth all weekend, play the game at least 50 times, and rally new people into our booth and explain the game to them. A huge shoutout to PnwSaberwolf for being such a huge fan! Thanks again for everyone who came out and played DropMix. We’re only a few short weeks away from its launch on September 25th and you can pre-order it now! If PAX was a sign of what’s to come, we can’t wait to listen to the mixes you create and share! 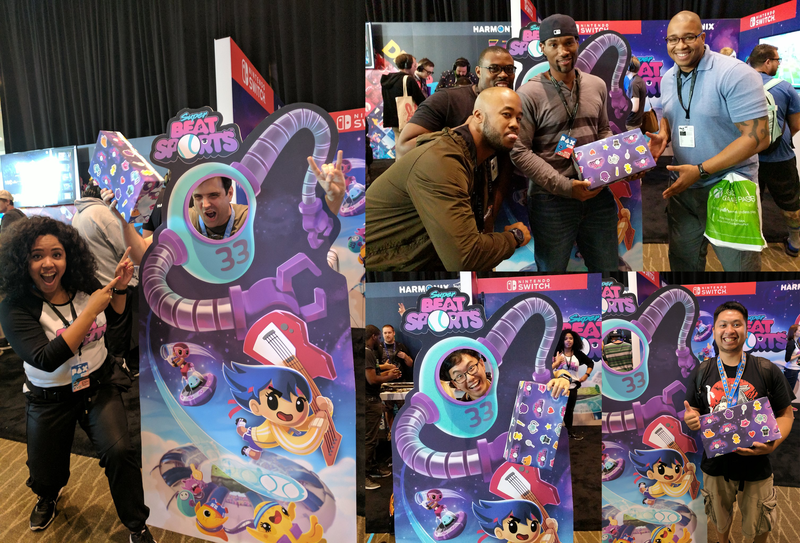 Three days before PAX, we announced our latest game, a Nintendo Switch exclusive, Super Beat Sports! In case you missed our announcement, Super Beat Sports is a collection of five sports-themed mini games with a twist - everything is musical. Swing, volley, and score to the beat of the music to get that gold! PAX West was the first time anyone was able to get their hands on the game, and the reception was outstanding. Children pulled their parents towards the adorable characters on our standee, groups of fans repeatedly came back and duked it out in fierce Buddy Ball competition, and many took on Thro-Bot together in Whacky Bat. First Time PAXer Alicia Shares Her Experience! Including our amazing friends at Hasbro, 15 people joined us at PAX! For some of them, it was their first time traveling to and experiencing the con! Alicia Caillier, one of the Product Managers for Super Beat Sports, was one of the new faces to the show. We asked her for her impressions and thoughts from the show, so without further ado, take it away Alicia! I could not have imagined a better way to celebrate my first year of working at Harmonix other than attending PAX West with the Super Beat Sports team! Having never attended an event for gamers before, I was super anxious and excited to immerse myself fully in the experience. I really had no idea what to expect… And while I was super exhausted by the fourth day, I definitely can say that this PAX was one for the books. Checking out all of the games and insane booths in the main exhibit hall, discovering new Indie titles, showing off Super Beat Sports, dancing and singing all day along to the DropMix mixes, and meeting fans of Harmonix was incredible, but the highlight of my experience was definitely discovering the Diversity Lounge. I met some fine folks and got some cool swag from organizations like Geeks OUT, the AbleGamers Charity, GeekGirlCon and I Need Diverse Games who are all respectively working to advocate for diversity and representation in the gaming community. As a woman of color, who also works in games, this show of support at PAX was extremely welcoming. I’m definitely looking forward to the next PAX event! PAX West was an outstanding time for everyone involved – the team we sent to the show, our amazing support team back in Boston, and you, the fans and players of our games. You helped us exceed our expectations, and we couldn’t have asked for a better time in Seattle – even the weather was great! It was truly special to everyone on the team. Every time we hit the road, we look forward to hearing your stories about our games: past, present and future. We saw lots of Rock Band lanyards from last year’s PAX West (go Team Analog [ed. note: Boo, Team Analog]! ), Amplitude Backer t-shirts, Fantasia: Music Evolved t-shirts, families smiling playing Super Beat Sports, and jaws dropping at DropMix stations. I’m about three hours into this flight, so it’s time for a nap before this final group of HMXers lands back in Boston. We’ll see you again at the next show, wherever that may be! 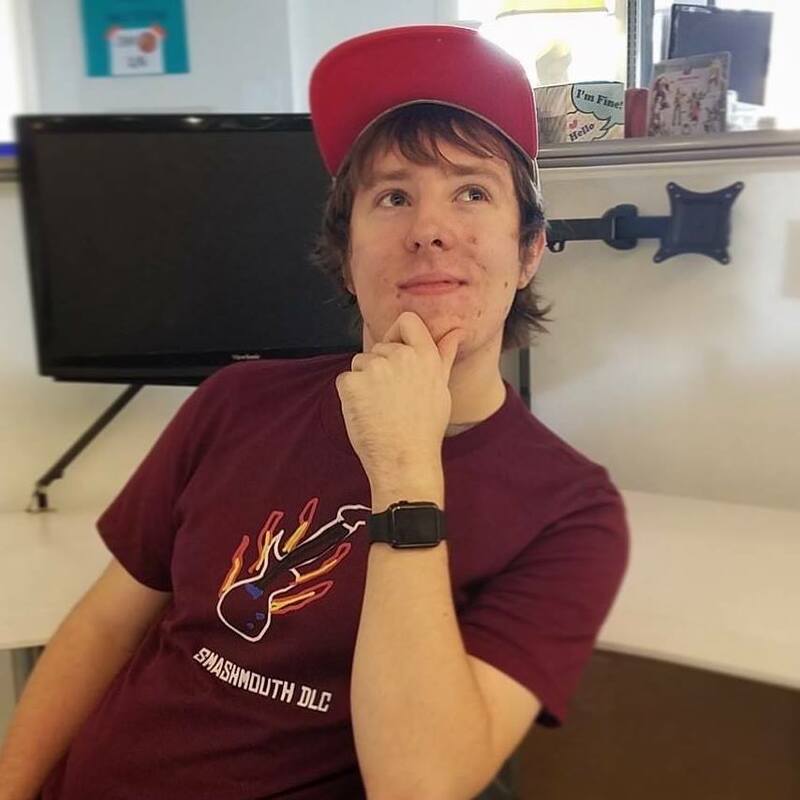 Nick is on the Community Team at Harmonix, currently working on Rock Band, Super Beat Sports, DropMix and more!